Lake Como has a surface area of 145.9 square km and a maximum depth of 410 meters. It is the third lake for its area and the first for its depth in Italy. The lake is rich in fish and lush vegetation that grows on its banks, Mediterranean vegetation as olive and lemon trees, azaleas, rhododendrons and camellias, which together with the historic beauty of the nearby centres create a very popular tourist destination. Surrounded by mountains and valleys, the lake offers numerous routes for the lovers of sports. Mountain bike, boat or foot, any way you choose to move, you can fully enjoy the natural beauty of the lake. One of the most popular itineraries and more beautiful is that through the natural park of Spina Verde which offers a series of spectacular views of the Lake. During the travel you can stop and relax in one of the many huts on the way and enjoy the typical local cuisine. A nice circuit to be done by car is the one that starts from the town of Lecco, crosses the Adda and follows the western shore of the lake with the SS 583 until Onno. From Onno, going through Valbrona you reach Asso. Here begins a very beautiful scenic road that climbs to the Valassina until the passage of the Ghisallo and goes down to Bellagio. From Bellagio, along the SS 583, running along the east bank of the branch of Lake Como, you arrive in Como. Continuing along the nearby street 340 you return to the central basin and explore the northern branch, until you return to Lecco or via the street 36, convenient and fast, or via the old scenic road next to the lake. Both of them offer charming landscapes. Passo del Ghisallo: where is the beautiful sanctuary of the Madonna del Ghisallo and splendid views of the lake. Bellagio: important for its location and the old town of small alleys, villas and panoramic views. Lasnigo: this is where it lies the ancient church of S. Alexander, with the bell tower dating back to the twelfth century. Como: a city full of modern and contemporary art. Cernobbio: with large villas and a stunning lakeside. Sala Comacina: the only island of the lake. Tremezzo: where Villa Carlotta, covered with azaleas and rhododendrons, is located. Ossuccio: with its impressive gothic bell tower. Gravedona: with the church of S. Maria del Tiglio, a typical example of Lombard Romanesque architecture. Corenno Plinio: small but gracious village on the lakeshore. Colico: you can walk to the Abbey of Piona, a former Cluniac monastery. Varenna: presents a fascinating lakefront where you can stroll observing all the beauties of the town. Fiumelatte: with its homonimuos small and delicate stream going through it. The name Como evokes many suggestions: not only the incipit of the most famous Italian novel, I Promessi Sposi by Alessandro Manzoni ( “that branch of Lake Como …”), but also precious silks, which are produced here to be sold in all the boutiques of the world, and the sparkle of electricity, discovered by the famous Alessandro Volta. Each of these suggestions may constitute the starting point for a journey of discovery of Como. 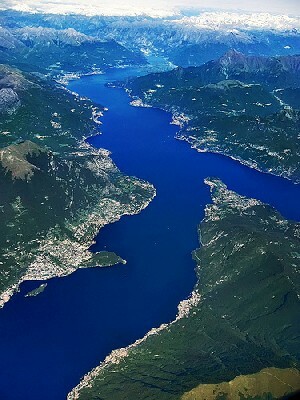 Lake Como can be reached along the motorway linking Milan to Como (A8 and A9) and to the Canton Ticino, or through the state way 342 coming from Varese and the 369, which reaches Lecco from Como. By train you arrive there via Milan with the Italian State Railways, or with the Ferrovie Nord Milano.